The course of your life can change in an instant. 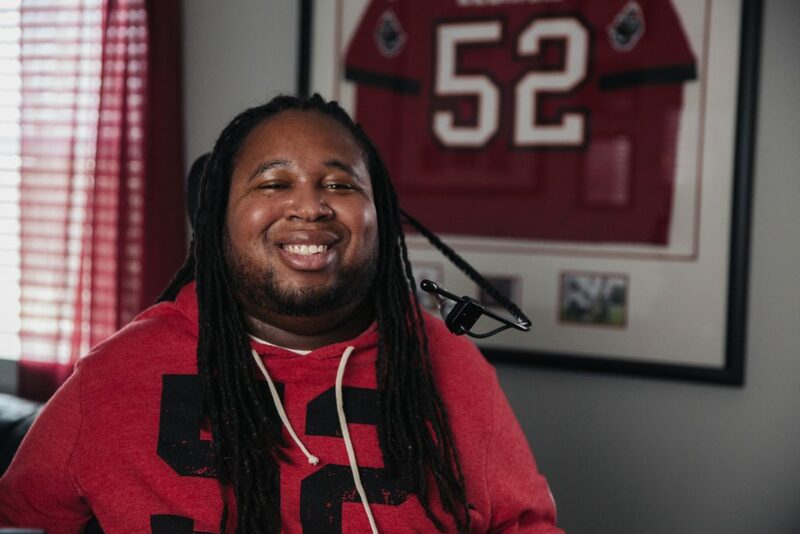 That’s something Eric LeGrand understands well: the life-altering repercussions of a split second missed tackle are ones he lives with every day. Growing up in New Jersey in the ’90s, Eric always loved sports. “I’ve played ball pretty much from the time I was five years old,” he remembers. “I was always the happiest outside playing in the park and playing football, baseball, and basketball.” It was football, though, which got him noticed during high school. He went on to play for Rutgers, starting on special teams and then working his way up to defensive lineman, where he racked up 33 tackles in his 2009 season. LeGrand describes this period of training and practice as a grueling but ultimately rewarding challenge. Those skills–including the ability to persevere in the face of physical pain and personal challenge–were ones that LeGrand would turn out to need in his life off the field, as well as on. 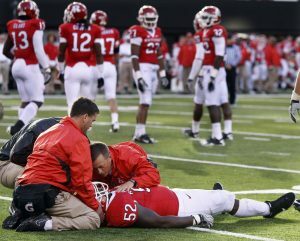 The aftermath of the collision that ended LeGrand’s Rutgers career and left him paralyzed. The game that changed everything for Eric took place in the fall of 2010. Rutgers was facing Army, when LeGrand collided with Malcolm Brown. Both men were injured. Brown, who twisted his upper body just before impact, was left with a broken collarbone, but it was LeGrand who would never play football again: he was left paralyzed with a fractured C-3 and C-4 vertebrae. The accident was LeGrand’s first and last injury on the football field. It was also the only time he had ever played in an NFL Stadium. In the immediate aftermath of the accident, LeGrand thought his paralysis might be temporary, due to a “stinger”: a common football injury that affects the nerves after a blow. “I thought it was a full body stinger, which I thought was causing me to not have the ability to move. I remember waking up [later in the hospital] and still being unable to move and that’s when I knew it was bad,” he says. LeGrand’s prognosis was bleak: Doctors initially told his mother he only had a 5% chance of regaining any neurological function and surviving. In the years since, though, he has regained some movement in his shoulders and reports sensations throughout his body. And while he will probably never play football again, LeGrand says he hopes that he may walk one day again. Yet the transition from an active athlete in the prime of his youth to someone who needed help for the simplest task was not an easy one. At first, LeGrand champed having to rely on others for even the simplest tasks. “Having to trust people to do things for me, like get me dressed, feed me, help me call somebody was very difficult,” he remembers. 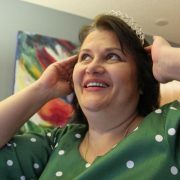 In time, however, LeGrand realized that the people who were helping him–his mother, his family, his nurses, and physical therapists–were on his team. And if football had taught LeGrand anything, it’s that a good team makes everyone stronger. 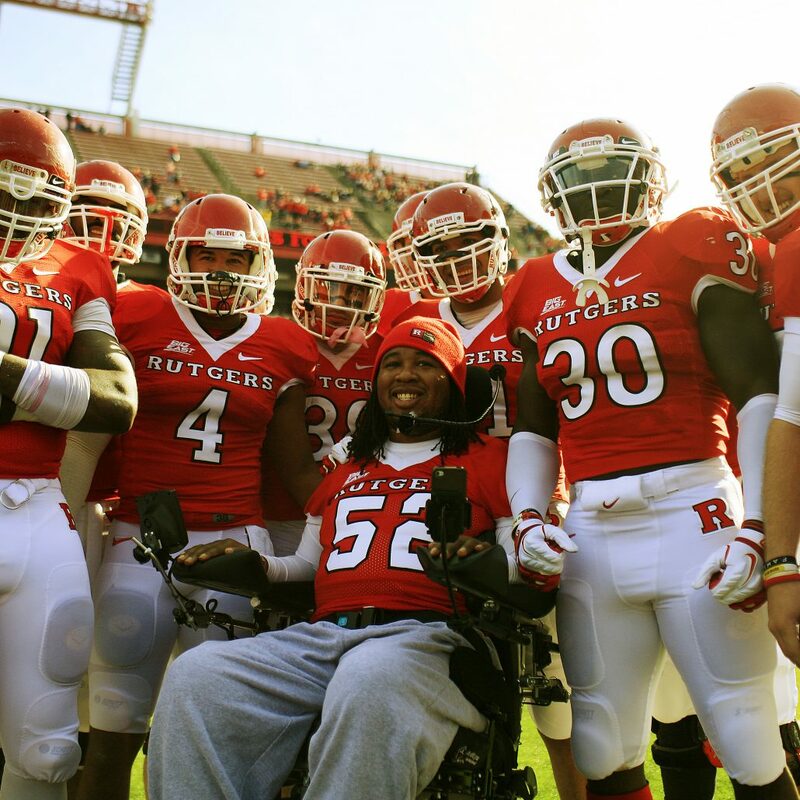 LeGrand posing with his fellow Rutgers teammates. Since his accident, Eric has become an inspirational figure among both the football and disabled communities. 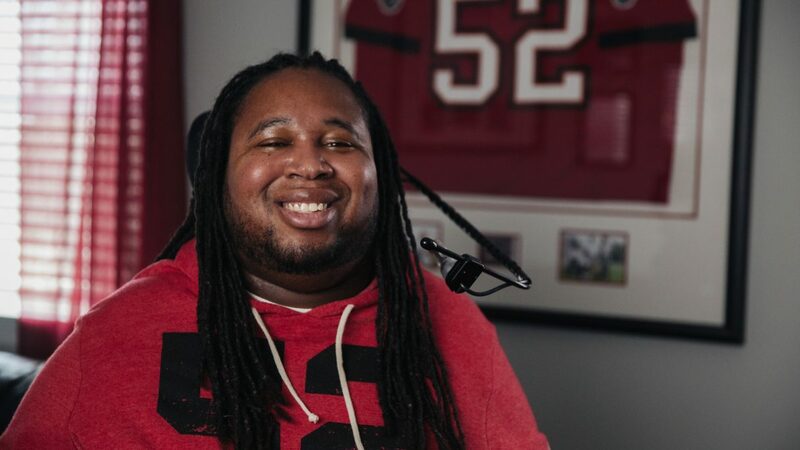 He spreads positivity and hope as a radio host and motivational speaker; his most recent web series, Mission Possible, features Eric talking alongside a celebrity guest with everyday people living with different types of disabilities. He is also the founder of Team LeGrand of the Christopher & Dana Reeve Foundation, which fundraises for research programs aiming to improve the lives of people like LeGrand living with paralysis and spinal cord injuries. He’s even written a book about his journey, Believe: My Faith and The Tackle That Changed My Life. For LeGrand, that word–belief–has special significance. “You’ve got to believe in yourself and the man above, because anything is possible,” he says. At the same time, though, you can’t just sit around and wait for things to change, especially when a traumatic injury is concerned. If LeGrand’s story is testament to anything, it’s that individual action that makes the impossible possible.